Lentils with Spanish chorizo sausage. This has to be one of my favorite comfort foods. This is a recipe that I have grown up with and could eat every day if I had to. It’s a simple recipe that my children enjoy. Chorizo Sausage and Pimenton are two staple Spanish ingredients in this recipe. Chorizo is a dry/cured sausage that is found in every local bar and household in Spain. The taste is amazing. In Spain, they sell different varieties of Chorizo. Some that can be cut into thin slices and eaten in sandwiches (bocadillos or montaditos), and other varieties that are meant to be used for cooking in stews. Pimenton, is Spanish Paprika. It gives a great smokey flavor to foods. 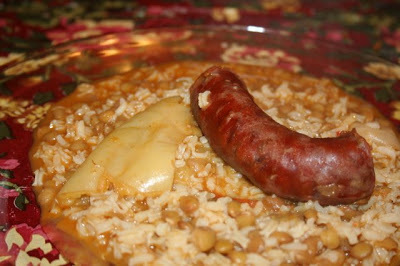 One of my favorite Spanish comfort foods is lentejas con chorizo, lentil beans with Spanish chorizo sausage. This is one your kids will love! In a large pot put the lentil beans, chorizo sausage, green pepper, tomato, onion, garlic cloves, and 2 bay leaves. Cover with water 2 inches above the beans, sausage and vegetables. Mix in the Olive Oil and Smoked Paprika. Bring to a boil and then simmer for 30 - 40 minutes or until the lentils are tender. Once the lentils are tender, add the white rice and simmer for an additional 20 minutes until the rice has cooked all the way through. As you can tell, this is simple to make. There is no need to dice the vegetables. Just slice them in half and add them in. My favorite thing about this recipe is that it tastes even better the day after! I am a huge fan of Spanish chorizo.YAY for this recipe! I just made this yesterday and it is sooo good! I actually added some homemade chicken broth instead of water to give it more taste. Wonderful!